We feel it is our responsibility to set an example and run our business driven by efficiency and results. We consistently outperform our peers in fiscal responsibility, accountability, and transparency. We direct nearly 90% of our total budget to research and related programming. The MMRF has received a “Best in America” Seal of Excellence from the Independent Charities of America, and an “A+” rating from the American Institute of Philanthropy. The MMRF has earned Charity Navigator’s four-star rating for 14 years and is recognized by Philanthropedia as one of 16 expert-identified, high-impact nonprofits in the field of cancer. We are also in compliance with all of the Better Business Bureau’s Wise Giving Alliance Standards for Charity Accountability. Additionally, the MMRF has received approval from the National Cancer Institute for its research grants program. The bottom line is that our success has come because we feel a keen sense of responsibility to the patients we serve and of accountability to the donors who support us. 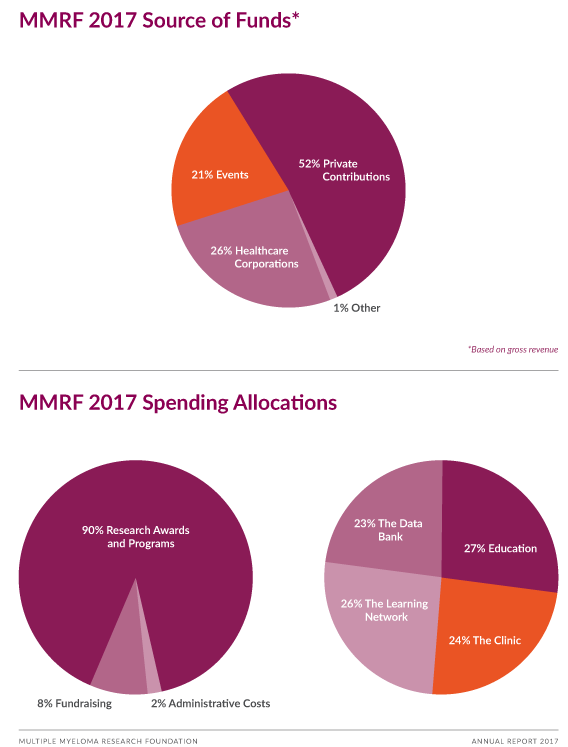 An outstanding, nearly 90% of the MMRF total budget goes directly to research and related programming, consistently earning us top rankings from the nation’s leading charity evaluators.